Is keeping track of your things a daily challenge for you? Not being able to find something when you need it is annoying. Not being able to find the same thing over and over again can slowly drive you crazy. Not surprisingly, the things we lose the most are also the things we carry around with us and use most often. 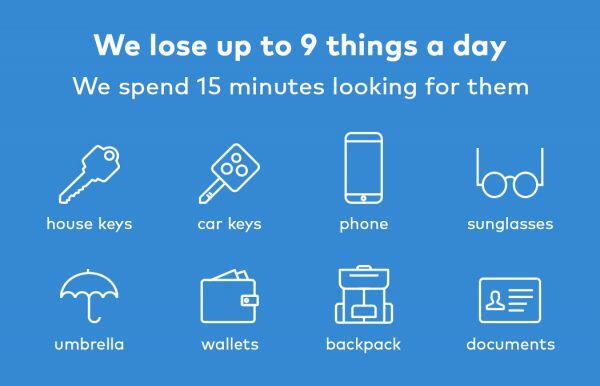 Home keys and car keys are repeatedly at the top of every ‘lost item’ list made. It’s like they’re made to be lost; they’re small, we carry them with us wherever we go, we use them all the time and put them away in different places. How many times have you found yourself in front of a locked home or car door, reaching into your pocket, only to find you’ve lost your keys again? When we realize we lost our keys, the first instinct is to panic. And then we get angry at ourselves because it happened again. This might help us vent our frustrations, but it won’t help us do a focused and productive search for lost keys. Instead, try to stay calm and start searching. Check the place where your keys are supposed to be. Sometimes, we just miss them the first time around and double checking might help you avoid unnecessary searches. 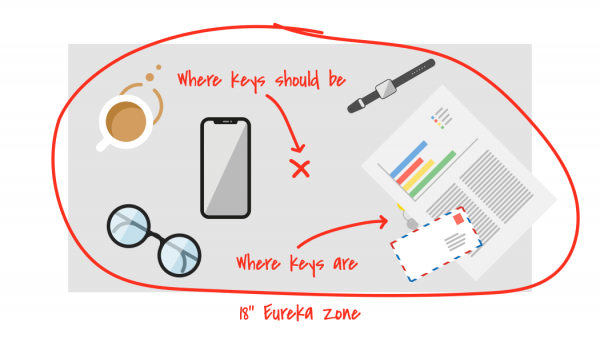 Professor Solomon theorizes that most lost objects (keys included) remain within 18 inches of their designated spot, they’re just a little off their usual location. He calls this 18-inch-wide zone the Eureka Zone. Don’t waste time searching the same places repeatedly, just because the keys are supposed to be there. Instead search systematically and only move to the next room or space after you thoroughly searched the previous one. An experiment at the University of Aberdeen in Scotland revealed that our eyes subconsciously focus on neater areas when we search. We do this even when it’s obvious that the keys we’re looking for are not there. Your mind is your greatest asset. Think about the moment when you last had your keys with you. Close your eyes and think about the location, what you were doing, what time it was, who you were with, what you were feeling… The technical term for this is ‘context reinstatement’ and it is a phenomenon that is successfully used with eyewitnesses to crimes, so finding your lost car keys should be a picnic in comparison. But beware – in some cases, your mind can play tricks on you and introduce a false memory that will lead you in the wrong direction. Don’t overthink it! This is not an all-around solution, since car keys, burglar-proof doors and anti-theft locks usually have expensive keys that sometimes require proof of ownership before a copy can be made. However, getting a copy of your basic door key isn’t that expensive or complicated, so do it. 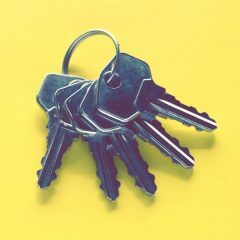 Weigh the possibility of you permanently losing your keys against the hassle and expense of creating a copy in advance and decide which keys you should make a copy of. And if you do go for it, don’t forget where you stored the replacements! Tip 5: Prevention Is King! It’s always easier to stop something from happening than it is to repair the damage after it’s already happened. Keeping a clean environment is highly effective when it comes to finding lost things, and also, seeing how tidy your home is, is bound to cheer you up. This one will take some willpower but force yourself to develop a habit and always put your keys (and other things) in the same place. Studies have shown that on average it only takes 66 days to form a habit, so give it a try! Sometimes our brainpower alone is not enough, especially after a rough day. 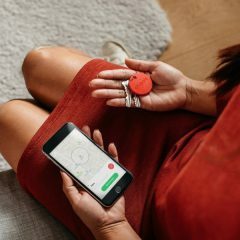 Get a smart keyfinder, attach it to your keys and connect it to your phone. This way, you can use your phone to find your keys or use your keys to find your phone. And because we tend to share our keys with other people, Chipolo will even let you share the tracker virtually through their app, so other people can help you search for your lost keys. If it’s something small or inconspicuous make it pop with bright colors. Add a big colorful keychain to your keys or paint the bow of the key a color that stands out. Add a reflective patch to your wallet and put neon sticky notes on your documents. Remember that most things eventually turn up, so if it’s not something you absolutely need right now, don’t worry about it. It won’t help you find your keys, but it will help with your peace of mind.